Pound 4 Pound Boxing Report #123 – Upset Of The Year… So Far!!! – The long reign of WBA Jr. Lightweight champion Takashi Uchiyama come to a shocking end as he’s stopped in two rounds by Jezreel Corrales in what has to be considered the upset of the year so far in 2016. 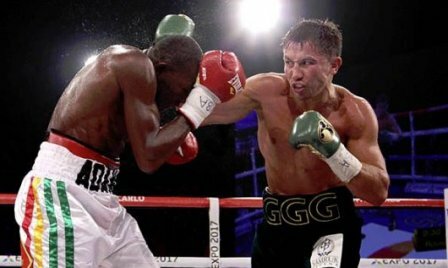 – OK, Gennady Golovkin stopped Dominic Wade (as we all knew he would) in two rounds. Now how close are we to seeing “GGG” fight “Canelo” Alvarez? – “Chocolatito” Gonzalez handily defeats McWilliams Arroyo by technical decision. Afterwards, the talk has not only been about what’s next for Gonzalez, but is Gonzalez the true P4P king? – Carlos Cuadras dominated Richie Mepranum, then called out Roman Gonzalez and Juan Francisco Estrada. Will we see Cuadras get the chance to fighter either? – Our thoughts on the press conference. – Sergey Kovalev next fight will be against Isaac Chilemba in Russia on July 11. – Anthony Joshua will make his first title defense against Dominic Breazeale on June 25. Pound 4 Pound Boxing Report Podcast 2/6/14 – Did HBO Drop the Ball Regarding GGG? – Gennady Golovkin’s 7th round TKO over Osumano Adama. The backdrop of HBO’s failure to air this fight, and why no other American television networks failed to cover this fight. Also, what’s next up for Golovkin. – Luis Collazo upsets Victor Ortiz via second round stoppage. Is it time for Ortiz to call it a day. – Gilberto Ramirez 1st round TKO over Don Mouton. Is Ramirez the next Middleweight star? – Anthony Joshua second round stoppage of Dorian Parch. Assessment of Joshua’s early pro start. What is his potential. – A deal is close to being done for a Mikey Garcia – Yuriorkis Gamboa showdown. – The WBC has elevated Julio Cesar Chavez Jr. to number one contender in their ratings. Is this another case of Chavez Jr. getting privileges that he doesn’t deserve. – A preview of Bradley – Pacquiao II.